Keeping Phnom Penh moving. Who needs a white van when you have a tuk tuk. Watching Cambodia Traffic. At first glance, watching Cambodia traffic in Phnom Penh is just one giant mash up; a noisy bedlam of mosquito like machines; a free for all. A dodgem car ride at the fairground looks more orderly. Horns are beeping constantly and whoever and whatever can fit on a moped seems to be on the roads. Tuks tuks here are different to what we’ve just experienced in Thailand. 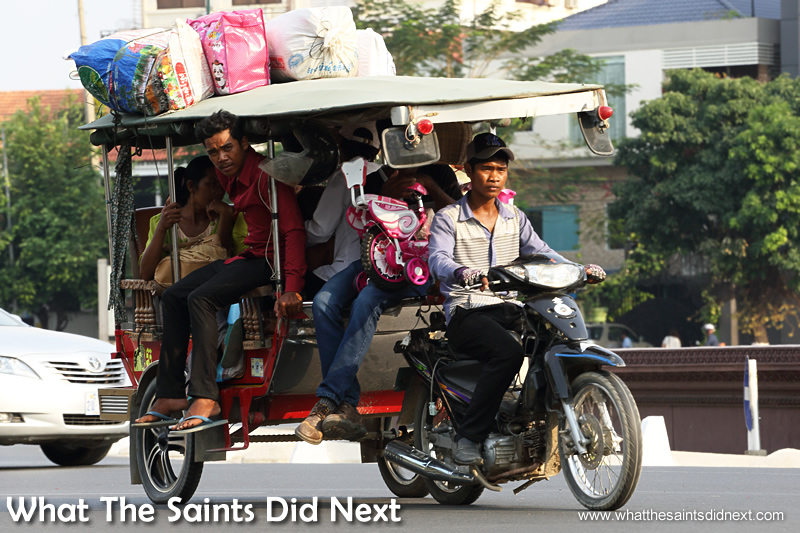 The Phnom Penh version is a regular moped modified with a knuckle joint type coupling across the back seat, which connects to a two wheeled, carriage type trailer, where the passengers sit. The bedlam of the Phnom Penh traffic viewed up close from inside a tuk tuk. Watching Cambodia Traffic. 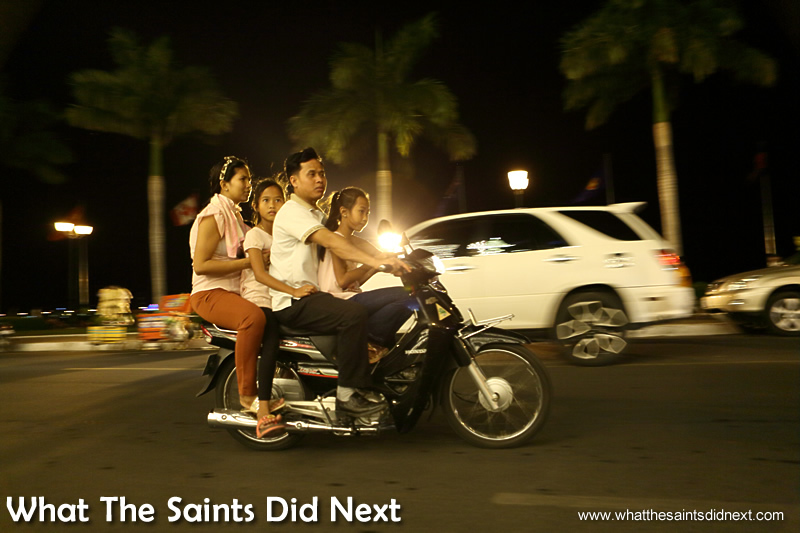 The mighty moped, five people on this one, no problem. Watching Cambodia Traffic. One of Phnom Penh’s dedicated cargo tuk tuks. Watching Cambodia Traffic. Conventional motor cars are in the minority although it seems SUVs are the preferred choice in this regard. There are thousands and thousands of mopeds on the road, crammed in, side by side and bumper to bumper so to speak. 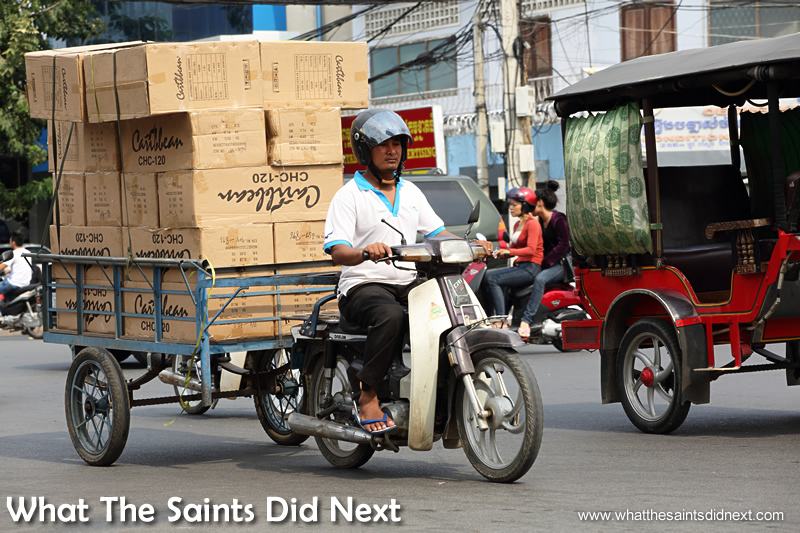 They carry everything you can think of and more: propane gas cylinders, water bottles, sewage pipes, cement, bottled water, fresh produce… you name it, they seem to get it on the moped. I saw one dragging seven metre lengths of rebar iron along the road. Another driver carried what must have been two dozen live geese across the back seat, piled one on top of the other and strapped down tightly, looking pitifully helpless and alarmed. But the locals don’t bat an eye, unlike us, staring with mouths agape in disbelief. Health & Safety rules are little less strict here. 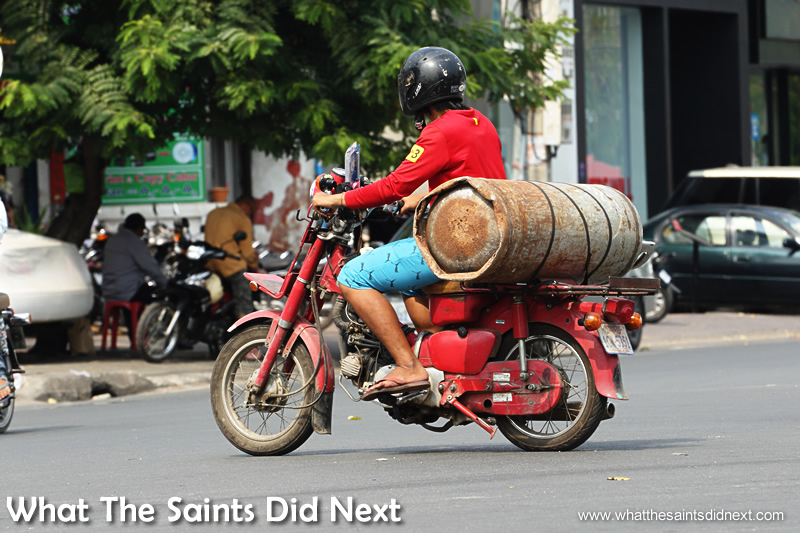 Gas cylinders are whizzed about on mopeds quite easily. Watching Cambodia Traffic. Not all intersections have traffic lights, but this one does which halts everyone for a minute. Watching Cambodia Traffic. Watching the traffic is one of my favourite things to do in this city. Sad, I know! I keep expecting the inevitable traffic jam and crunching sound of colliding scooters with angry drivers shouting at each other – but it never happens. Instead, the traffic just flows. Constantly and in every direction. They drive on the right hand side of the road, but then we quite often meet vehicles coming the wrong way down the lane in front of us! But no one seems surprised or upset; there’s no horn honking, no wild gesticulating, not even a shake of the head from our tuk tuk driver. Drivers just move over to make space. No fuss. A family out for the night, cruising through the Riverside in Phnom Penh. Watching Cambodia Traffic. 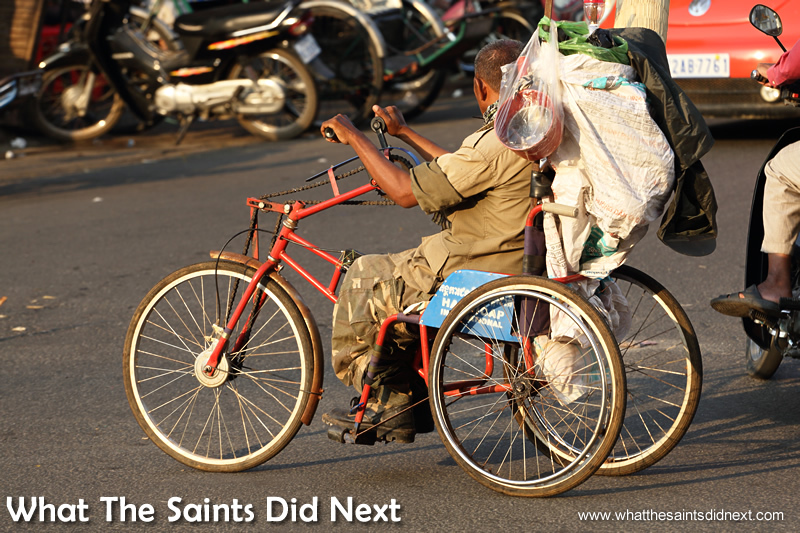 Plenty of creativity for getting mobile – A wheelchair/cycle hybrid for moving around the streets. Watching Cambodia Traffic. After hours of watching the traffic I think I may have it sussed. Here’s my four day assessment! There is one key factor that makes this apparent mayhem work. Speed. Or rather, the lack of speed. The traffic all moves at quite a slow pace; 25mph perhaps or slower. This allows plenty of reaction time to what’s up ahead. The busy intersections might appear like a free for all at first glance, but in reality the slow speed allows the moped drivers to pick a line and stay on it, with plenty of time to calculate the rate of closure of other vehicles crossing in front of them. So there’s no need for traffic lights or long waiting periods at the junctions. 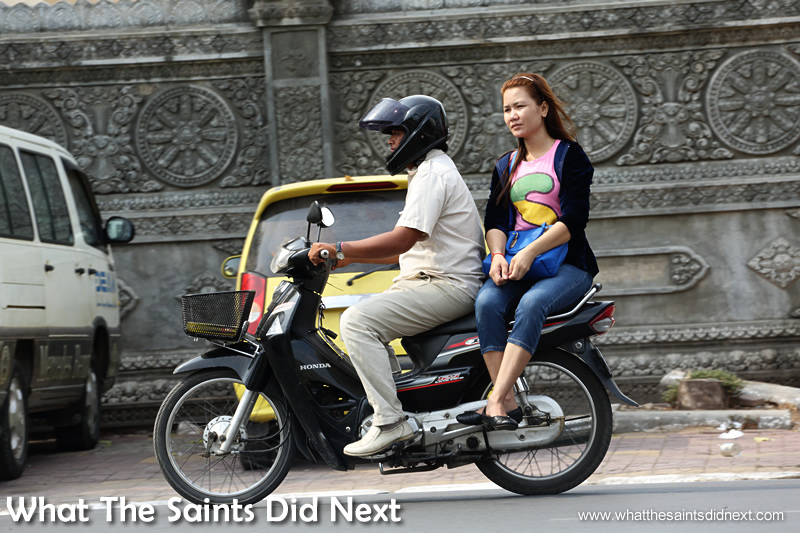 The moped drivers rarely put their feet down to stop. They just slow down or alter their line slightly to avoid other drivers. In fact, it’s pretty impressive. A four road intersection with all entry and exit points flowing all the time. The road courtesy is also impressive. Horns are used to warn people you are approaching, not to scold them for getting in the way. Drivers pulling out into the road tend not to look back to see what’s coming behind them, instead it seems to be the responsibility of each driver to avoid what’s in front of them rather than worry about what’s coming behind. Gosh, I can just imagine the reaction if you tried this in the UK! Full? Never! Loads of room, jump on. 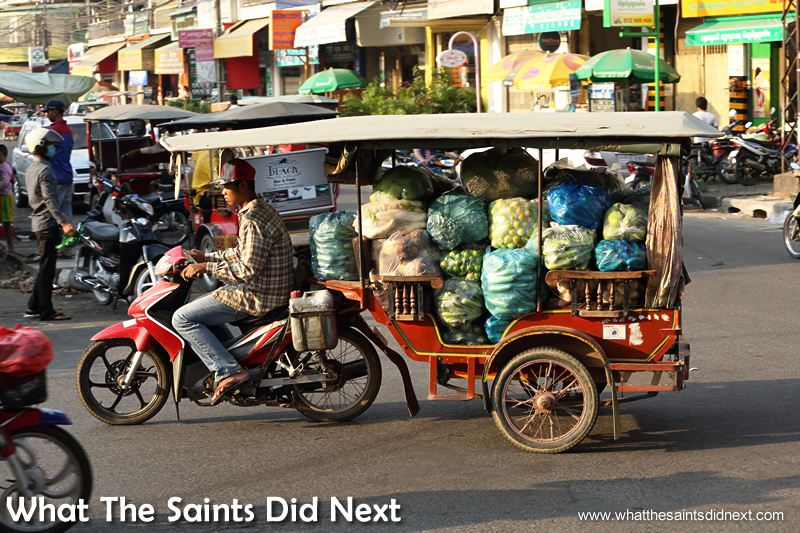 Every available space on the tuk tuk is used in Cambodia. Watching Cambodia Traffic. A tuk tuk driver poses for a picture near the Royal Palace in Phnom Penh, Cambodia. While the system works brilliantly for Phnom Penh, I can see how it would have problems transferring to a city such as London. 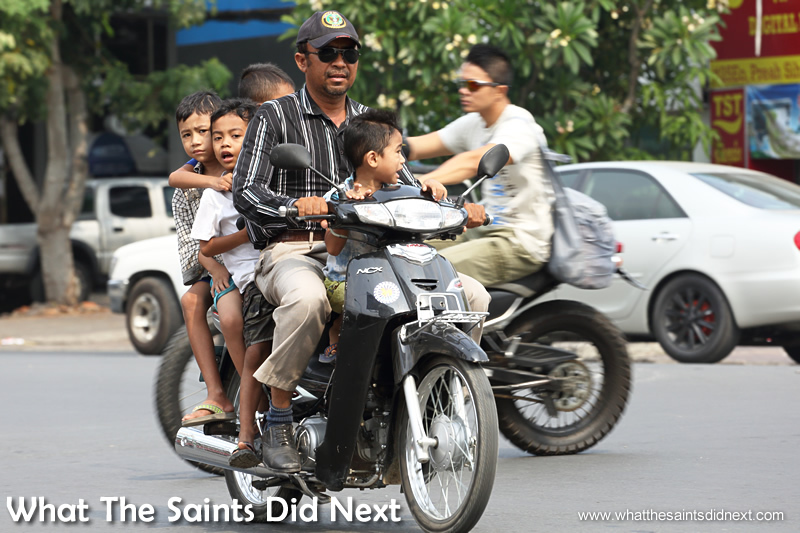 For a start, the weather in Cambodia allows the mopeds to be a standard and comfortable mode of transport. Everyone wears flip flops. Imagine a chilly mid January morning in London with six layers on, riding a 50cc moped through rainy streets with puddles everywhere! And then health and safety; it’s either non-existent of just very different in Cambodia. A mother carrying three kids on a single moped, including a baby, without helmets or any sort of harness and also balancing the week’s groceries, would probably not sit well with highway authorities in Europe. The side saddle passengers make it look so easy! Watching Cambodia Traffic. 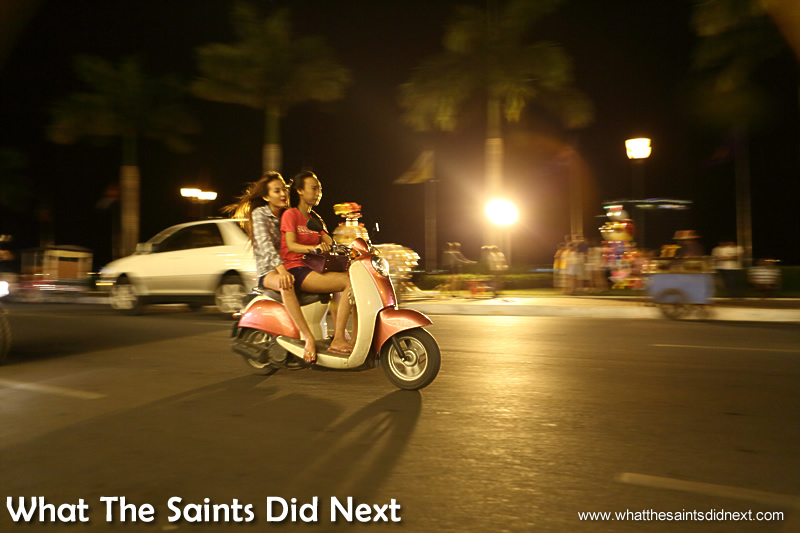 Young girls out for the night on the Riverside in Phnom Penh. Watching Cambodia Traffic. But it works here and it works well. 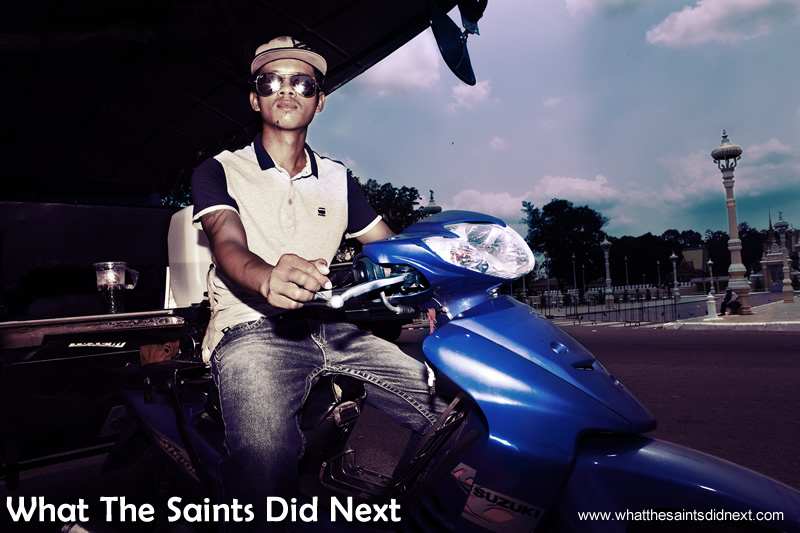 The weather, the infrastructure, the culture, the people, the city – it’s all evolved into the system before me? And you know what? 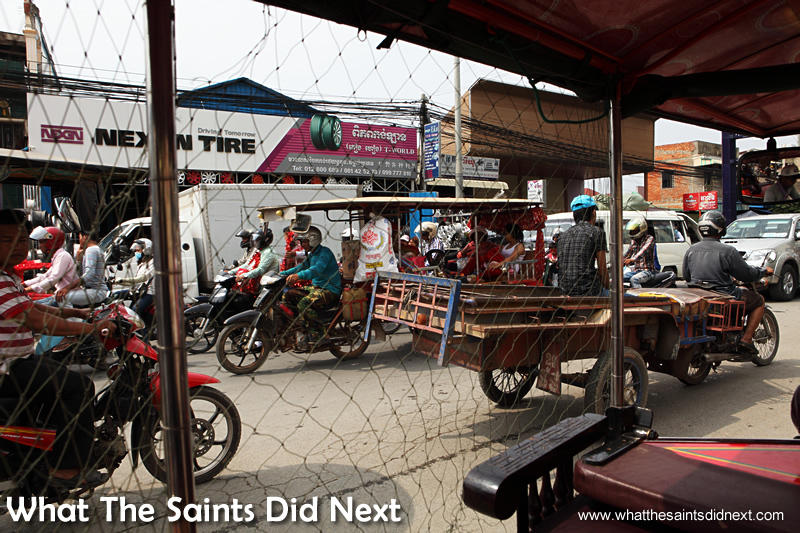 During my entire visit I never saw one accident in Phnom Penh. 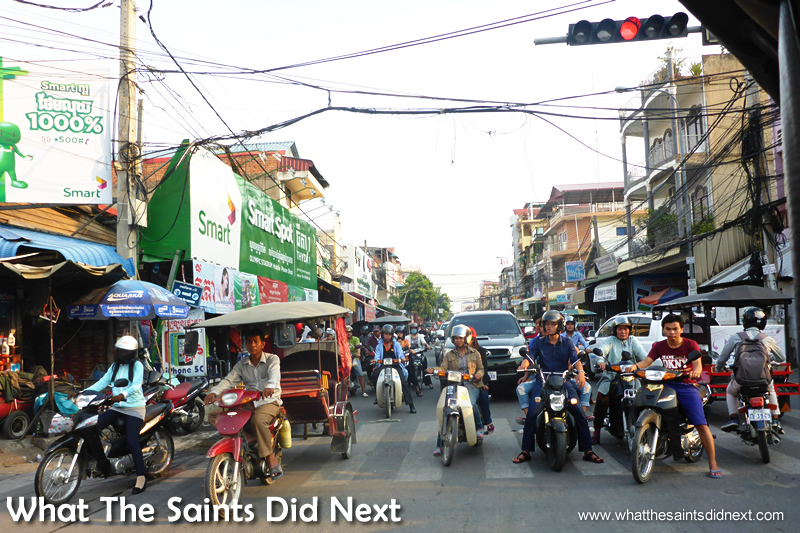 It’s one of the most fascinating things about my visit to Cambodia, in fact South East Asia in general; watching the traffic. Unfortunately if the tuk tuk drivers catch you they become convinced you need a lift and will then pester you to hire them! But otherwise, it’s good fun. All sorts of mechanical and human powered forms of transport can be seen on the roads. If anyone can dig out a picture of the Polar Bear from his pre-car days, clad in balaclava – please publish! Folks might be surprised to know that the most dangerous transport in Cambodia is the daily commute of the garment girls from their ghettos to/from factories. 16 killed two weeks ago! But it keeps down the price of our clothes! I can remember when Robin had his bike. We did not wear helmets in those days and I can also remember Keith My self was on the bike and little Pam sat on the petrol tank! So it was four of us, I never realize how dangerous it was. That would never happen now days! 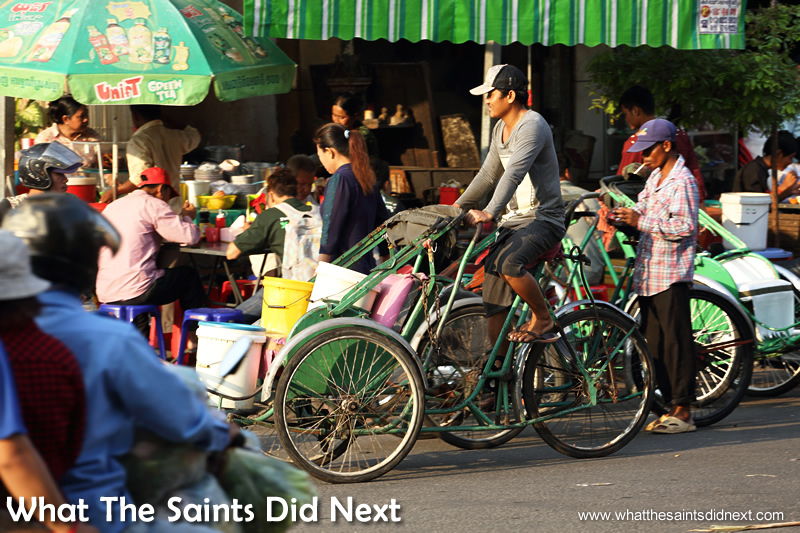 This is really exciting, looking back at this and reflecting in the day when Saints use to drive bikes without any safety protection the difference is we didn’t use bikes to pull and transport supply trailers we use donkeys those days. This is so funny makes me laugh. Keep them coming. Haha, glad this made you laugh. I forgot how similar some of this is with St Helena from earlier years.